Writing has long been how I best communicate. Being in front of groups terrifies me. Even on one-on-one conversations, I sometimes fumble over my words and wonder afterward if I said too much or not enough. When I write, I find freedom. I surprised some people – including myself – when I walked out of the newsroom for the last time on Sept. 14, 2007. But I’ve never stopped writing. But now instead of gathering information to tell other people’s stories, I often search my own life for what God’s teaching me. It’s easy to write about my kids. They’re my favorite stories. So that’s what I did. I wrote an ebook about how I journeyed through infertility and adoption to become a momma. It rocked my world in more than one way. And it’s the story I will tell over and over again forever because it’s where I met God in a new way. I always wondered if I’d write a book. And now I can say I have. Sure, it’s an ebook. But it’s still every ounce of me poured out. The pages have been edited by friends, Greg, and myself – and then again by a professional. I’ve read them over and over both on paper, on my computer screen, and in my mind. 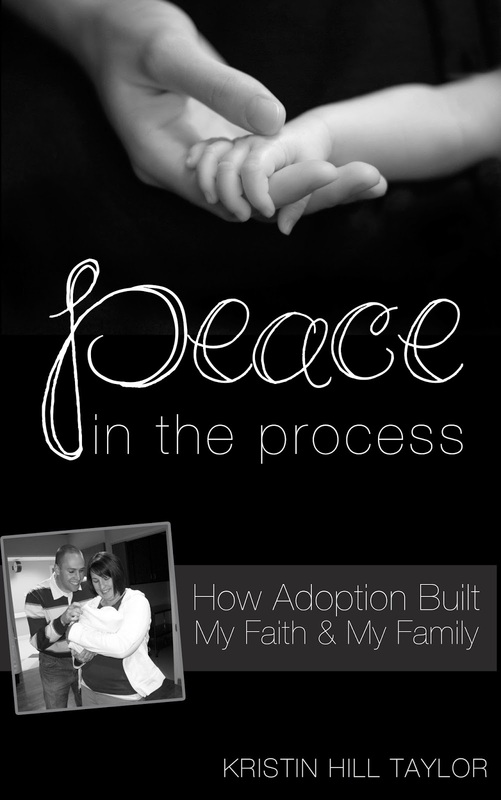 So, without further ado, I introduce you to “Peace in the Process: How Adoption Built My Faith & My Family,” which is available on Amazon. I pray the words bless you in whatever journey you’re on. I pray you’re encouraged by how God works while you’re waiting and he really does hear the desires of your heart. I wrote this book. But I didn’t do it alone. In the back of the book, I thank some people. This list could have been so much longer, but I tried to limit it who had a direct influence on this particular book. Other friends are mentioned in the book itself because they’re intertwined with my story. This is how I live life – with the people I love. Gathering around tables with them is part of our life – and you’ll see some of that in my book. And let’s do it virtually now. I’m glad you’re here. Today is like a party – and what’s a party without gifts?! In honor of my book and my life, I’m giving away four copies of my new ebook and some other goodies! “Bread & Wine: A Love Letter to Life Around the Table With Recipes” by Shauna Niequist :: My sweet friend Beth donated the copy “Bread & Wine” one of you will win because she encourages me well and loved the book as much as I did. It is the kind of book I’ve been recommending and thinking about long after I read the last page. I’ve made a recipe from it and hope to make others. I gave it to a friend because just a few chapters in, I knew she needed to read it. P-E-A-C-E Scrabble decor by Cathy Baker :: This sweet God-sized dreaming friend of mine has an Etsy shop full of goodies and she donated this for my launch party. This giveaway is open to U.S. and Canadian residents. Four winners will be chosen using the Rafflecopter below on Wednesday, Oct. 22. Each winner will receive a copy of “Peace in the Process” and another one of these gifts. If you’re an early reader of my book, free free to enter anyway because I can always send the winning copy of my ebook to someone you want to encourage. And stay tuned because there are more giveaways and stories coming your way. Thanks for gathering here with me. I know a few people in my life who need to know how to read Kindle books without a Kindle. Good news is doing so possible with the free Kindle app, which is available for Android and Apple devices as well as a desktop computer. More info on that here. If you still need help, let me know and I’ll help you figure out how to read my book ... and, of course, any others available on Amazon! I'm linking up this post with Holley Gerth's Coffee for Your Heart and Jennifer Dukes Lee's #TellHisStory. Congratulations on finishing your book! Sharing stories is so important. Well done and congratulations! A very exciting time, and it sounds like a great read .. I'd love to win any one of these prizes! Thank you for hosting this giveaway! Thanks, sweet Kelcie! I'm grateful for your encouragement. Thanks for visiting and for your kind words, Kate! Hi, Christie! Thanks for commenting here. I just made the chicken enchilada recipe from Bread & Wine last night. It's so delicious and in our regular rotation around here! Congrats, friend! So proud of you! Congratulations! That takes a lot of hard work and tears! Thanks, Sarah. It's been a therapeutic process, that's for sure! I've learned much and enjoyed it. I love to hear stories about the ways God builds families. Mine didn't come about the way I ever imagined either, but I wouldn't ask for anything else. Looking forward to reading your book! I'd love to hear more about your story, Beth! Thanks for coming by! I love reading your words, friend...thank you for being brave enough to share your story. It's a beautiful one. :) Congratulations! Thank you, Mel. I've missed connecting with you online lately, but I am so grateful for your encouragement. Hope you're doing well. XOXO. I can't wait to read your whole story! I'd most like to receive Bread and Wine. It sounds like a great book for me right now. Congratulations on publishing your story! Thanks, Tabitha! I'm glad you entered the giveaway!